The project aimed to encourage students to explore the way graphic design contributes to and reproduces cultural meanings that affect social issues and practices. prime minister’s statement, 28 July 2014, ‘Women should not laugh aloud in public’. 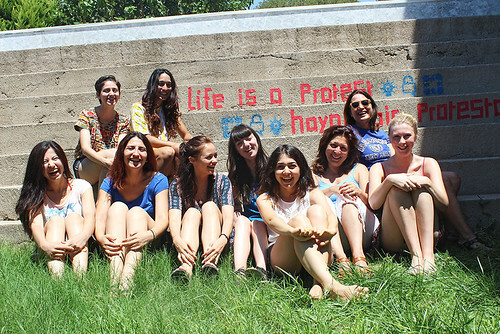 Left to right: Görkem Işme, Gizem Cansu Horoz, Şevval Ceylan, Gülnar Mimaroğlu, Freya Smith, Emily Jane Todd, Dilşad Aladağ, Gülizar Çepoğlu and Roxanne Bottomley. Top: Ferhat Akbaba, Resist Istanbul. 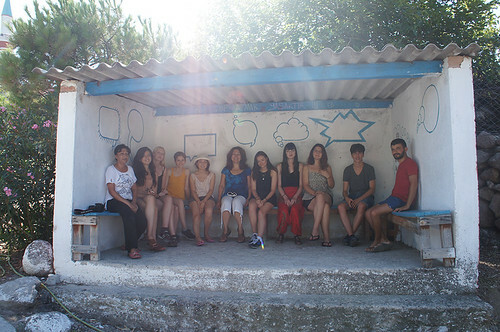 Workshops spanning fifteen days were held at a purpose-built centre established by designer and artist Emre Senan and Prof. Ayşegül Izer who have been contributing to design education since 2006 by organising international summer workshops in Yahşibey, free of charge. (See ‘Critical heat on the Aegean coast’ in Eye 89). In total, 65 design students applied to join the workshop through their respective universities in the UK, Germany and Turkey, of whom ten were selected. The design of the building, by architect Nevzat Sayın, played an important role in achieving a productive group dynamic. The students enjoyed working and living together in this space, which had a central staircase overlooking the pool where we sat for our discussions. At 5.30 am each morning we awoke to the morning prayer call and started our day early, which was essential given the overpowering summer heat on the Aegean coast. Cleber Rafael De Campos. 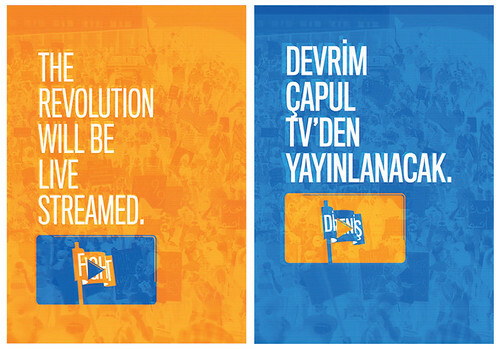 The Turkish version of the poster states ‘The revolution will by live-streamed by Çapul TV’, a reference to the Gezi Park independent TV channel whose name came from ‘çapulcu’ [looters], which was used by prime minister Erdogan to describe the protesters. Almost overnight, the word’s meaning changed from ‘looters’ to ‘rebels’. Emily Jane Todd’s Turkish poster shows the homemade penguin masks worn by Turkish protesters to ridicule CNN Turk, which broadcast a penguin documentary during the early days of the Gezi protests. To bring a variety of design approaches and perspectives to the project, I invited three design professionals with different design approaches to hold workshops. The first began with Tzortzis Rallis, a Greek design activist and co-founder of the London-based Occupied Times magazine (see ‘The Bloomsbury set’ on the Eye blog). With his presentation and practice-led research findings, Rallis introduced the students to historical and contemporary cases of agitational graphics and visual strategies for protest. The bond between Tzortzis, the Turkish students and the local people soon refuted the general prejudice that Turks and Greeks do not get along well and the group rapidly embraced the cultural differences and resolved language barriers. The students translated slogans from protests in different countries and cultures and then re-wrote and communicated these slogans as visual messages for a more global context. 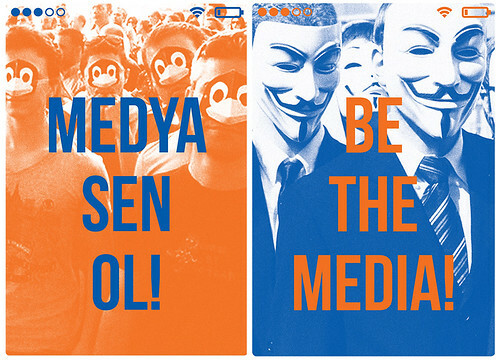 Students produced a series of protest posters in pairs for Turkish and English in two contrasting colours. Top row: Ryan Young, Freya Smith, Emily Jane Todd. Bottom row: Gizem Cansu Horoz and Dilşad Aladağ. 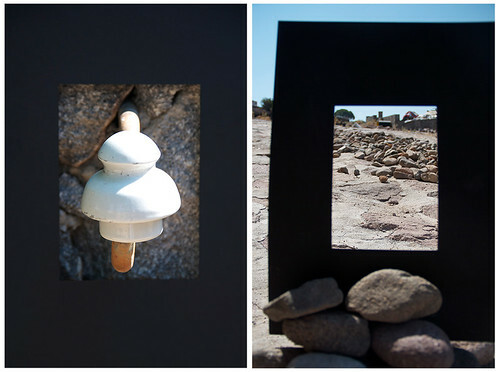 Ryan Young (left) framed a representation of ‘freedom and rejecting the norm – breaking the frame’. Gizem Cansu Horoz (right) framed the constrast between imprisonment and freedom. Just before Rallis left Yahşibey, our other guests, writer Sarah Snaith and designer Joseph Bisat Marshall, arrived to run a workshop under the general brief of design activism and social change. Day one saw students using and reinterpreting everyday objects to create narratives conveying their feelings on political unrest. They were then challenged to interview each other in pairs and discover which political or social issue moved the other person to engage in activism. In this way they developed valuable interviewing and writing skills and produced cut and paste magazine spreads with limited materials. 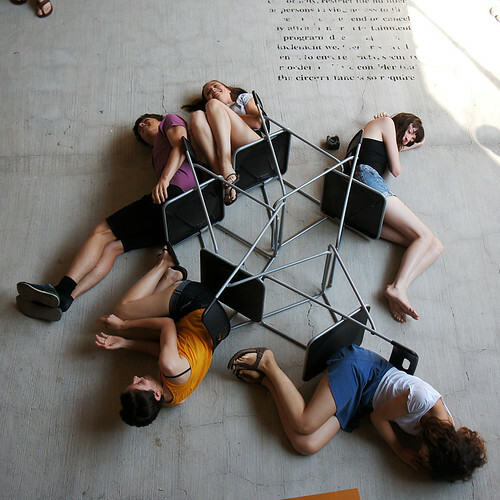 The following day, Snaith and Marshall asked the group to think about a moment in their lives that had invoked protest and to build a 3D installation that represented that moment. This experience collectively removed constraints and aided the students to think creatively and express themselves freely. 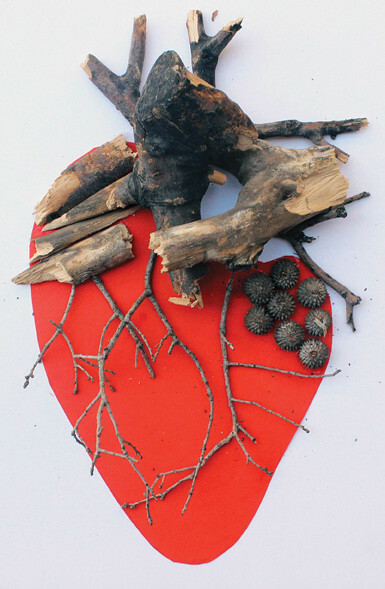 Ryan Young, What’s inside your insides. 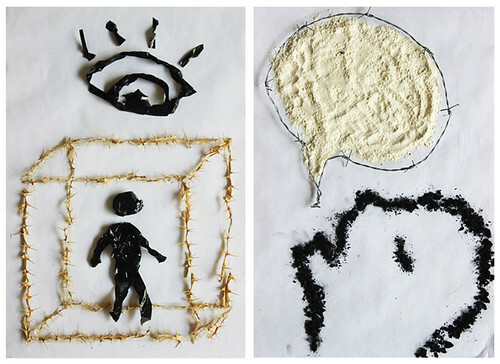 The remaining workshop days made students use word-images to create counter-narratives as a social and democratic act, and transcend language barriers, producing visual messages for a global audience. A shared language of words and images was mapped out. 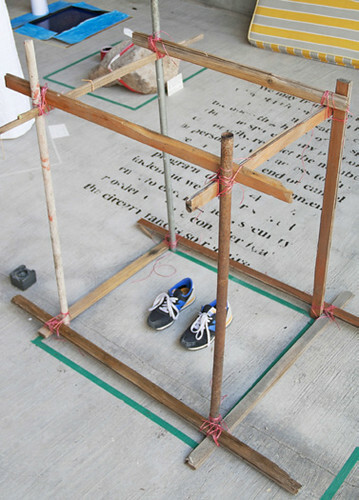 They then focussed on the semantic content to produce their own signs and symbols that summed up their counter-narratives in ways that transcended cultural boundaries. The power of expression inherent in a visual sign systems is appealing to new media especially to social media since the introduction of digital technologies and icons, symbols, glyphs, pictograms have become one of the most popular means of conveying messages, and I wanted to challenge students on this. 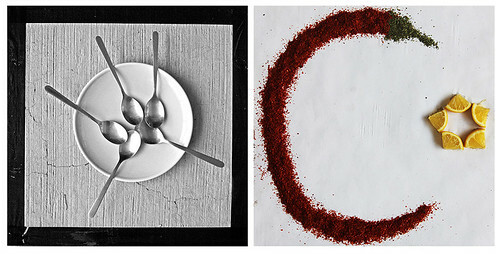 Dilşad Aladağ’s ‘sharing’ icon (left) and Ferhat Akbaba’s Turkish flag icon (right) which uses materials that refer to pepper spray and acidic chemical burns. 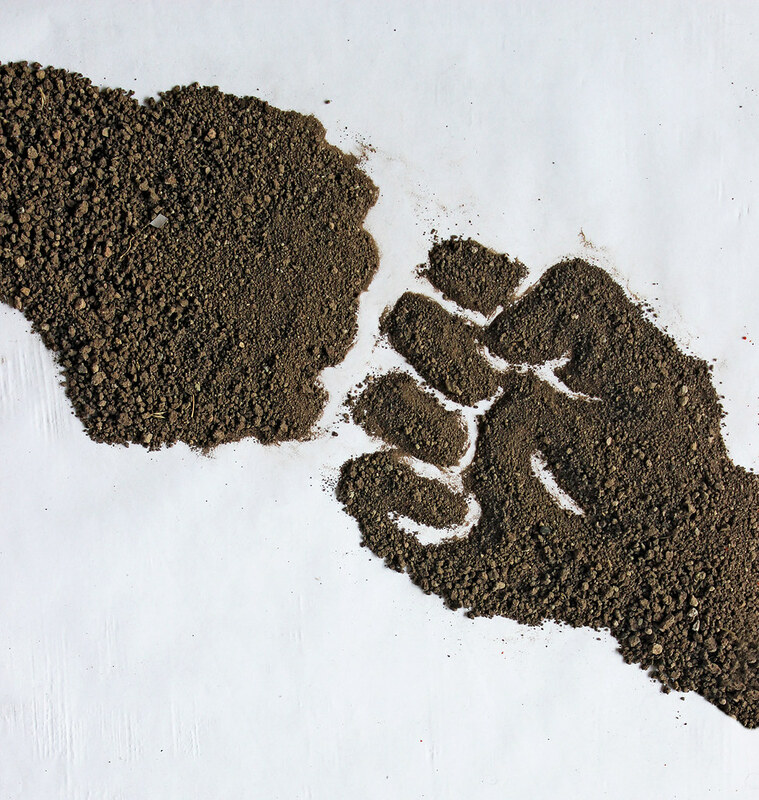 Ferhat Akbaba’s posters make reference to surveillance and the Soma mine disasters of May 2014. 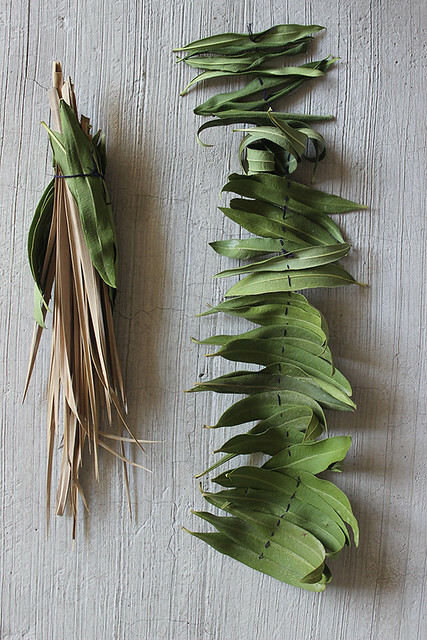 We reflected on how digital technologies help us to reconcile image-word binaries. After a brief look at different writing systems, from hieroglyphs to ideograms, the students took off to design their own text-free symbols that demonstrated political stances. Having grasped that the computer was not the only tool in their arsenal, they decided to use physical materials from the immediate environment. Görkem Işme’s icon references the proposed demolition of sycamore trees in Gezi Park which spurred the protests that began in 2013. This was not an experimental workshop but a critical one, examining communication design as a political, social and democratic act. The project highlighted the value of live workshops, something lauded by Jonathan Ives in a recent Dezeen interview where he bemoaned the lack of workshops on design courses by saying that design students no longer know how to make things, because workshops in design schools are expensive and computers are cheaper. 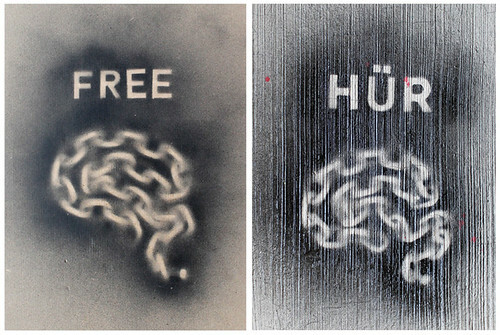 Gizem Cansu Horoz’s icons We will not be programmed (left) and a locked speech bubble with street sign No to No (right). 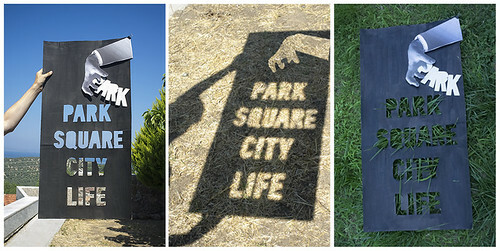 Dilşad Aladağ, Don’t touch my park, square, city, life. Görkem Işme, Be Free and Hür ol. A ‘free speech’ bus stop, designed and painted by the students as a community project for the benefit of the villagers of Yahşibey.